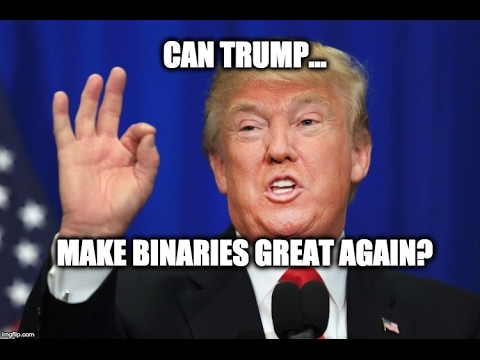 Can Donald Trump save binary options? Donald Trump is planning to abolish Net Neutrality. This is big news. But what does it mean for Binary Options and could it help get rid of fraud brokers? Kay and Zio debate it on this lastest episode of the Binary Bears. I don't understand why we need robots in this field anyway. If it'll make a broker's work more transparent and reliable, then why not? But if it will mean less effective work results or changes in the tax code, then that's bad. I think Trump has enough on his plate right now without having to think about options. He's got more important things to do. But that any one of his statements can influence the movement of price is a fact. I have experienced first hand what a trump supporter does in binary options. It's not pretty LOL.